Maggie Willcox, the wife of the Arctic Sunrise captain Peter Willcox, speaks about her husband’s lifelong commitment to environmental activism and how that now might be costing him his health. The wife of the Arctic Sunrise captain Peter Willcox says she had waited for him to come into her life for 33 years. That is why a 7-year jail sentence, which the Russian criminal justice system stipulates for hooliganism, would be a very high price to pay for the Greenpeace protest action on the Russian oil platform. Since her husband's arrest Maggie Willcox, a U.S. national, has been able to speak to him on the phone only twice. She says all she can do now is pray that the Russian authorities set the environmentalists and sailors free. 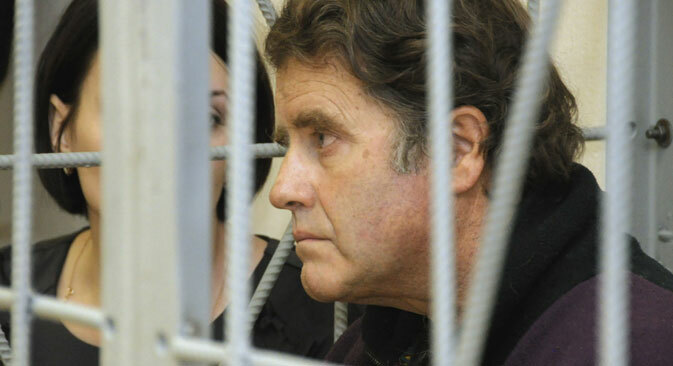 Gazeta.ru: Please tell us about Peter. How long have you known each other? How did you meet? Papers in America say you had a wedding only eight months ago. The ship was a magnet for young people and students receiving environmental education. By the time I was able to join its crew, it was once again safe for people to take a dip in the Hudson, and to eat fish caught in the river. I was the ship’s cook, and Peter, who was only 23 years old at the time, was the captain. He was brimming with environmental ideas when we met, and I fell in love with him. In 1981 he left to join Greenpeace. I stayed behind; I set up my own bakery, and eventually got married. We met two years ago in Maine. The way it happened was, we just looked at each other, and realized that our time had finally come. Gazeta.ru: Peter has been a supporter of Greenpeace for a very long time. Do you know how he came to join the environmentalists? What are his priorities? Is he the ship's captain first, and a Greenpeace activist second, or is it the other way around? M.W. : Peter’s family was very socially active. As a young boy, he took part in protests against projects to build coal-fired power plants in his county, holding a toy sailing ship in one hand, and a banner in another. He was also among the protesters picketing Woolworth’s department stores. Initially he signed a contract with the Clearwater as a protest against the war in Vietnam. Before leaving the sloop in 1980, he hired the first woman captain in the ship’s history. Working for Greenpeace has always been and remains his dream. He likes to be out at sea; he was raised in a yachting family. And of course, it’s an ideal opportunity for him to be a civilian activist on a ship. Nevertheless, he is the captain of the ship first, and the safety of the ship and its passengers is his top priority. When he became a single father nine years ago, his relatives started to take care of his daughter while he was at sea. Gazeta.ru: Is Peter the captain of only the Arctic Sunrise, or does he captain another ship as well? Have there been any Greenpeace-related problems before, apart from the explosion on a ship in 1985? M.W. : He also works on other Greenpeace ships, the Esperanza and the new Rainbow Warrior (the first ship that bore than name was blown up in 1985 by the French secret services when Peter Willcox was its captain). There have been previous cases when members of the crew, including Peter, were arrested for illegally crossing the border – but they were always released after a few days. This arrest has been the most disproportionate reaction by a government since the 1985 explosion. Gazeta.ru: Did he call you during the latest trip to the Arctic? How did you learn of his arrest? M.W. : When he is at sea we usually keep in touch by email, and only rarely by telephone. I learned about the ship being seized when he copied me on his last email sent to the Greenpeace head office just before all communications were cut off. I do not believe that Peter is in any danger, or that he is being tortured or mistreated. He has let me know that all the Russians around him are very kind to him. I am only worried about his health because he has heart problems. If Peter is forced to spend the next seven years in jail, he will probably never again see his father, who is now 92. It could also be bad for his own health, so this means we will not have a lot of time left together. That is a very high price to pay for an attempt by activists stick a banner on the side of an oil platform. Gazeta.ru: Have you received any emails or phone calls from Peter after the September 18 events? What did he say? M.W. : I have spoken to Peter on the phone twice, on October 21 and November 1. On both occasions he sounded strong and positive. That's typical of Peter, that's how the whole family sees him. He said that everyone was treating him well. He assured me that his blood pressure was normal, and said that he had lost 11 kilos (24.3 pounds). I also received a letter in which he tried to comfort me. He wrote about various things concerning our marriage. He asked me to take care of the bills and of his daughters. He also asked me to find out how he could get more pills because his own supply was running low.